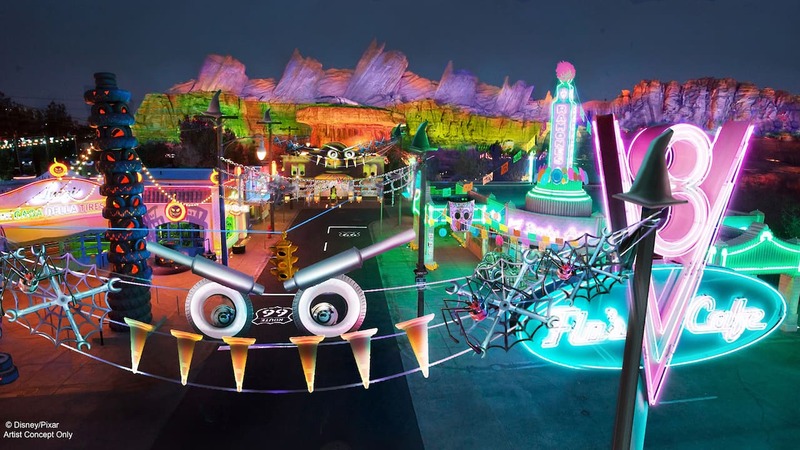 Cars Land Haul-O-Ween Celebration – The residents of Radiator Springs are decorating their establishments for the season, with Fillmore showing off his Jack-Oil-Lanterns and ghostly folk art, a Spider-Car spinning webs all over Flo’s V8 Café and more. Two Cars Land attractions will transform for the first time ever, with Luigi’s Rollickin’ Roadsters becoming Luigi’s Honkin’ Haul-O-Ween, and Mater’s Junkyard Jamboree becoming Mater’s Graveyard JamBOOree! Guardians of the Galaxy – Monsters After Dark – Once the sun sets each evening during Halloween Time at the Disneyland Resort, Guardians of the Galaxy – Mission: BREAKOUT! 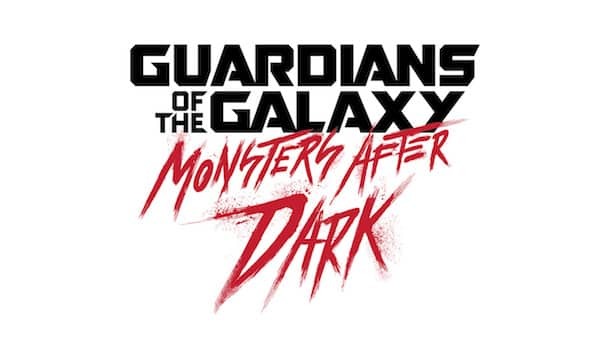 will transform into Guardians of the Galaxy – Monsters After Dark. The Guardians have successfully escaped The Collector’s Fortress, but they have accidentally left Groot behind! Help Rocket distract the creatures that have been released so he can find and rescue his little buddy. 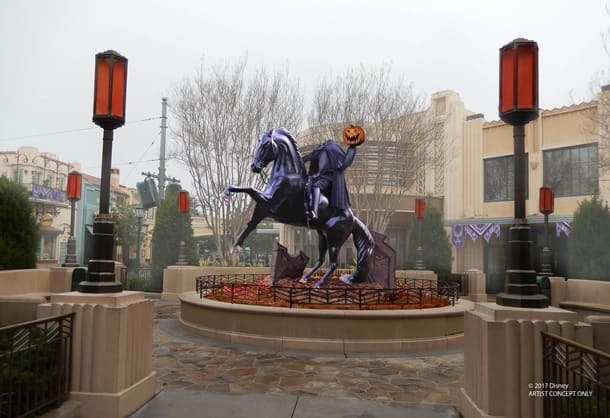 Headless Horseman Statue at Buena Vista Street – A new 10-foot-tall statue of the Headless Horseman of Sleepy Hollow, holding his jack-o’-lantern head up to the sky, will haunt Carthay Circle throughout the season. Characters in Costume – Mickey Mouse and his friends will appear in new costumes along Buena Vista Street, with Mickey Mouse as a bat, Goofy as a ghost, Daisy Duck as a witch and more! Oogie Boogie Welcomes You – A spell will be cast the moment you enter Disney California Adventure park, with new Halloween decor inspired by “Tim Burton’s The Nightmare Before Christmas.” Oogie Boogie’s oversized silhouette beckons guests through the main entrance as a swarm of bats encircle Carthay Circle Theatre. Which new experiences are you most looking forward to this year during Halloween Time at the Disneyland Resort? Tell us in the comments! When are more Oogie boogie popcorn buckets coming into stock? Is Mickeys Halloween Party every night? The Magic Kingdom will close at 7pm on Friday, October 27th for the party. Just wondering if we will get to see any of the Halloween characters in the parades or is everything saved for the parties? Don’t know if you’ll see this but Gaurdians closes at 5 so the Halloween one can open at 6. At 3 pm the fast passes change over to the Halloween one. Hopefully that helps! Love All The New Halloween Stuff At DCA, I Wanted To Know Will You Guys Have Disney Parks Blog Meet Up At The Disneyland Resort For Halloween Time? This will be my first Halloween experience with Disneyland so I’m excited to see DCA will be included in the fun also!! Can’t wait for the Happiest Haunts Tour at Disneyland as well as all the fun foods and merchandise that will be offered! I just love how the Halloween festivities have been added to all new areas. 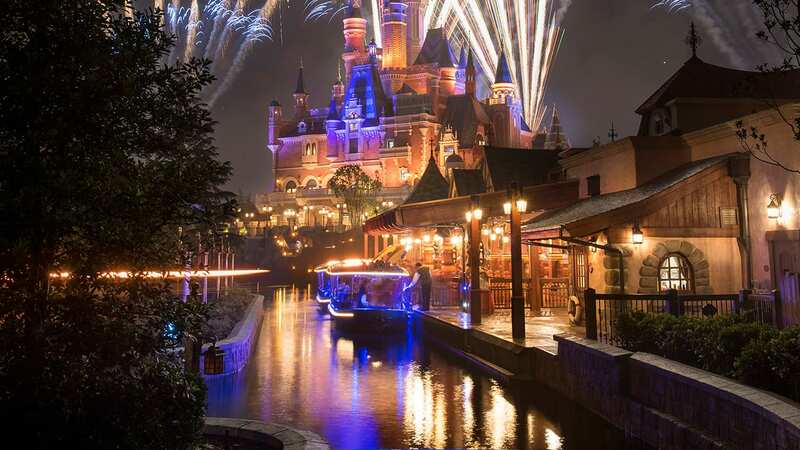 It looks amazing, but then Disney always know how to put on a show, decorate and add to the atmosphere of any occasion. Love Halloween and love everything Disney does for the season. 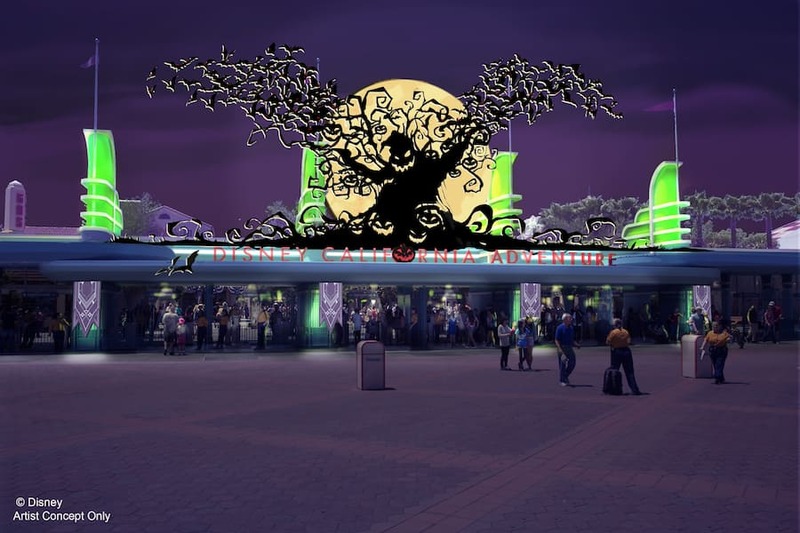 I am most excited to see (and photograph) Oogie Boogie’s oversized silhouette at the park entrance. That looks amazing! The new costumes for Mickey and Minnie sound really fun too. This is great news! Excited to see a more cohesive Halloween theme throughout the resort. Looking forward to Monsters after Dark. Erin, do you know how fast passes/MaxPass will work for Guardians after dark? Will there be a separate pool of fast passes we can reserve, or just the regular pool and regular way of getting them? If the regular way, what time does the attraction “switch over” so we can time which FP reservations to get? Thanks. More Nightmare Before Christmas is always a good thing! So excited for these updates, but I have to say it’s confusing to have Oogie Boogie over the entrance to this park when all the Nightmare Before Christmas attractions are in the other park. This all seems like so much fun… I have to say though, it’s confusing to put Oogie Boogie at the entrance to California Adventure when the Haunted Mansion Holiday isn’t even in that park. I would have gone with something more in line with the theme of California Adventure, or at least the rides that are there. So excited to see the new Halloween set up in both parks! We are visiting in late September and we can’t wait! When will we see the Halloween food, snacks, drinks and merchandise? I’m visiting on the 18th-22nd from Austin Texas and can’t wait!